This document gives a brief description of the history, structure and capabilities of Content Studio version 5. Content Studio is a product of Teknikhuset (Umeå, Sweden) that has been under constant development since 2001. Teknikhuset has its roots in multimedia and TV technology. The starting point of Content Studio was the development of a new web site for one of the major TV channels in Sweden. The first version was named TCMS (Teknikhuset Content Management System), but quite soon the name "Content Studio" was established. Since then, Content Studio has developed new ground-breaking technologies such as Active Scripting, EPT and the XML-index technology. Currently, over 50000 people are estimated to have access to work with solutions based on Content Studio. Content Studio is the only software developed in Sweden that has been approved by Verva (Swedish Administrative Development Agency) to have a framework contract with Swedish government bodies. In 2007, the magazine "Internet World" selected Content Studio as "the best large CMS system" on the Swedish market. Content Studio is now ready for its next gigantic leap. The plans to adapt Content Studio was realized when Microsoft released version 2.0 of the .NET framework in 2005. Until then, the .NET framework was not ready to meet the security requirements of Content Studio (and its customers). The core of Content Studio is now completely rewritten in C#. The platform now supports c#, VB.NET, user controls, ASP controls, master pages, .NET native cache and generally have much better performance. All site and server functionality is available via web services and a .NET API. Integration with other .NET based systems is much easier to achieve. Content Studio 5.0 is everything you can expect from Content Studio - and much more. The details on all the changes, and how to migrate from version 4, are described in the article Migrating to Content Studio 5. This is only a brief overview. Content Studio version 5 is on the surface very similar to earlier versions of Content Studio. The traditional interfaces to the database, the object model, EPT, XML-index and the editorial and administrative interfaces are virtually identical. Anyone who knows Content Studio version 4 will also understand version 5. Creating a web site is still as easy and efficient as it was with version 4. The new product is completely based on the .NET 2.0 technologies, whereas the previous versions used ASP technologies. This makes it possible to create web sites with much higher flexibility, performance and stability. This modern platform is investment for the future. Using .NET programming to create the web site. This includes using master pages, content pages, web parts, generic user controls and server controls directly on the web site. Visual support for user controls and server controls with drag-and-drop technology and full property control. Create and use web parts and precompiled components in any .NET language. New improved .NET API to the underlying site library which allows direct programming to the functionality that normally resides in the AS components. The new API is fully available via Web Services. The old Web API is still available and compatible. Full control over page attributes, style sheet management and meta-tag generation. Support for code-behind programming, assembly management inline C# and VB.NET programming inside Content Studio Improved management of generic code samples and inherited functionality. Managing security on fields and meta-data, allowing extremely detailed security control. Possibility to write server side validation functions. Transparently using the built-in cache mechanisms of the .NET platform. Application cache support for inserted documents Document Retrieval Cache (RDC) to minimize the database access load on all page references. It is much easier to connect to external data sources. Web services can be directly accessed without the need of DCOM server objects. Support for International Domain Names (IDN), post-back and view-state of posted data and server-side events within components and documents. The user interface looks virtually unchanged, but there are many improvements. For instance browse functionality on URL properties and directives, and on document and category identifiers. Also, the performance is improved to make the user interface faster. Improved and extended documentation, available as precompiled help files, HTML help or in PDF format. Most elements that are supplied with Content Studio work in the same way as before. Since most parts have been rewritten there may be small differences, but they are documented for each separate component. The cache server is replaced with the cache mechanism in the .NET platform. This leads to much better performance and greater control of the cached elements. Hence, the separate Cache Server component is excluded from the product. The anonymous write access is greatly simplified. It is no longer necessary to set up special user accounts and event handlers. All mechanisms can be managed with the regular AS component "Anonymous Writer" (EPT). A few of the least used AS components are removed from the product. Most of them have for a long time been considered deprecated and there are other components with similar or better functionality. PDF Server: Not yet implemented (expected in version 5.2). Customers with a valid maintenance agreement have access to version 5 without additional costs. The version 4 license is also valid for version 5 but a new license key must be obtained from Teknikhuset using the LicenseManager program that is shipped with the product. Most of the content is automatically useable in version 5, but some adaptation is probably necessary. Costs for adaptation work are not included in the maintenance agreement. Content Studio version 5 is not backward compatible with version 4 In order to support partners and customers with the migrating process, Teknikhuset has developed the CS 5 migration tool that can analyze a CS 4 site and optionally migrate it to the latest version. The details on all the changes, and how to migrate from version 4, are described in the article Migrating to Content Studio 5. The details on the migration tool are described in the article Migration tool. Microsoft SQL Server database to store all data. A web based administrative user interface for developers, administrators, and advanced editors. Microsoft .NET class libraries (Content Studio API). Web Services corresponding to the .NET class libraries. A number of tools for maintenance, installation etc. Of course, all of the classical Content Studio technologies are available. AJAX: The administrative user interface itself uses AJAX for increased functionality and performance. Content Studio runs smoothly on any 32-bit Windows Server (2003, Vista). Windows XP can be used for development and evaluation. From version 5.1 Content Studio has full support for 64-bits servers (Server 2003, Server 2008, Vista) is under development. For earlier versions 64-bit servers can be used only to host SQL Server on a separate server. The fundamental function of Content Studio is the ability to separate the document content from the actual presentation. This means that any provided content can be used in different ways depending on the situation. Content Studio solves this by creating the final view from three separate entities, known as the EPT (Edit and Presentation Template) technology. Content document: A set of data stored in an XML document, where the XML structure is hidden from the user. Edit template (ET): An input form that defines the data structure. Every set (category) of content document is defined with an edit template. 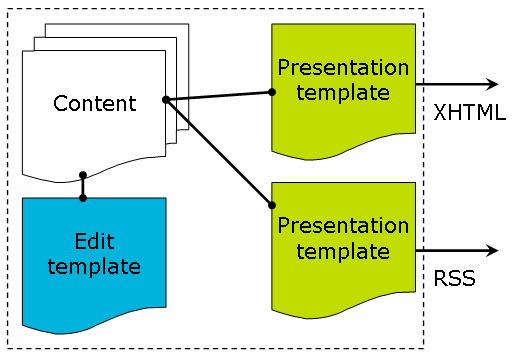 Presentation template (PT): A design description that defines what to display and how it should be displayed. Many PT can be defined to the same content, allowing different views of the same data. The data can be selected from any content document. The ET description describes that data that is available. Content Studio manages changes in these templates automatically. Users and developers should never have to make changes in the underlying SQL database. If there is a need to add or modify a data field in an ET, all corresponding documents are automatically altered. Security and access control has had the highest priority during the development process. Content Studio by default relies on the authentication of the Windows server environment. All users and groups that are available (local users or in Active Directory) can be used to control access to Content Studio. Access can be granted or denied on any level within the document structure. Access control can even be applied on individual elements within an included object by applying meta-data security checks. Any user catalogue can be used for authentication by applying a customized authentication provider. This is an advanced task, at the general recommendation is to rely on the Active Directory. Depending on the security settings, users have well specified access rights to the documents. The access rights can differ between different parts of the web site. A writer (that provides the content) does not necessarily have the right to approve the content. An editor (that controls the content) does not necessarily have the right to publish the content. The access right can be tailored for every individual site, depending on the desired need of control and supervision.